After a good night’s sleep and a leisurely breakfast at Uhuru Hostel in Moshi, we exchanged our dollars for TZ shillings ($1 =1490 Tanzania shillings) and were on our way to Same (pronounced “sa-may”) by early afternoon. Our first visit was with Bishop Mjema, the newly-elected Bishop of the Pare Diocese in Same. We had an excellent conversation with the Bishop and Mr. Tumaini Chambua regarding our partnership with Mramba Parish, a more in-depthconversation than we have had before with diocese staff. 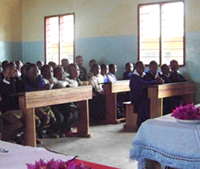 It is very clear that education of the children and youth of the Pare Diocese is of great importance to the bishop. The Diocese is very interested in how the Children’s Club established in Mramba for the Most Vulnerable Children is progressing. This Children’s Club is looked upon as a pilot program for all other parishes wishing to establish something similar. The bishop is also interested in setting up a scholarship program for vulnerable children to go to secondary school and in building or repairing a girl’s school in Pare. Later, as we relaxed at the Elephant Hotel, the coach of a local children’s soccer team came by to meet Jim Hammer and collect the 35 soccer shirts and 11 soccer balls Jim had brought for the local teams. It was quite a sight to see the coach climb onto his bicycle and head down the driveway with 35 shirts and 11 balls in a bag on his back. His smile said it all! On Friday, we loaded up our treasures and headed up the mountain to Mramba Parish to meet the new Pastor, Justin Mchome, and our host families. It is exciting to be so warmly welcomed by old and new friends. 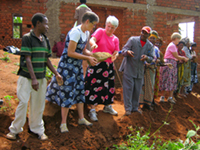 Some of us stayed with the host families we met during our first trip in 2008, so it truly was like coming home. The hospitality we experience at Mramba is beyond compare, and once you have made the journey, you will understand what we mean. Saturday was devoted to the official opening of the Most Vulnerable Children’s Club which is held at Vuje Primary School just a short walk down the mountain from the church. There we met 50 beautiful faces singing welcome songs in English. The children had written a poem about their experiences, and also a drama about a girl who received the opportunity to attend the Children’s Club. The drama reflected the lives of each one of the children there, and portrayed a girl praying for someone to help her so that she could attend school. The prayer was answered through the Children’s Club. The program teaches children life skills, supplementing what they learn in school (if they attend school), provides two nutritious meals and a snack, and also helps the children help their families. The children have planted a 12’ x 20’ garden with trench irrigation and were already growing beans! The food will be used on Saturdays, and the extra will be sent home with the children. Pastor Rachel officially opened the Most Vulnerable Children’s Club after a festive lunch, and presented the newly-trained teachers with graduation certificates…It was an amazing day! St. John’s will provide financial support for the Children’s Club (in partnership with Empower Tanzania, Inc.) when other start-up funding comes to an end this summer. Monday we spent visiting Mgombo sub-parish and briefly helped move stones for the construction of a retaining wall. St. John’s has contributed funds for the expansion of the church building at Mgambo, and new walls have been built and they are preparing to put on the new roof. We also visited some secondary schools and Dindimo Teachers Training College that afternoon, and ended the day with a brief visit to Gonja Hospital. We delivered 25 baby quilts (made by a member of St. John’s) and toured the hospital. Our time in Mramba came to an end with a farewell meal and thank-you speeches on Tuesday. We returned to Same that afternoon. Five of the members of our group then spent a few days with coffee farmers on the slopes of Kilimanjaro, before we were reunited for visits to two other projects – the Usangi Leadership Institute and a safe motherhood project in a remote Masai village. Our last day was spent at Ngorongoro Crater, which was green and full of animals - zebras, giraffes, elephants, lions and even a couple of cheetahs! On the evening of March 1, we boarded the plane for our long journey home, arriving safely the next evening. Our travelers will be presenting photos and more information on this most recent visit to Mramba Parish in the weeks ahead. 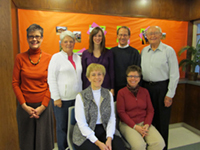 Please feel free to ask questions and, consider joining the next group to visit Mramba in 2012!